Of course I couldn’t read a word of that farking book. What was I thinking? So, after we got up and dressed on Monday morning, bought double espressos and sat right in the middle of the slanting, brick red pavement of the Piazza del Campo eating lovely prosciutto and formaggio sandwiches and had been waved off by Daniela, it was back to the international bookshop. I bought a travel-sized Inglese/Italiano dictionary. Unsure about the famously complex Italian bus network, we wandered up to Piazza Gramsci to find out which bus would take us to Siena’s railway station and, from there, out to Pienza on the 112 route. The entire system is deisgned to aggravate and upset tourists. In the UK there are bus timetables pasted up at every bus stop, and it is easily understood when the next bus is – or isn’t – coming. In Italy, there are few timetables and no maps of the routes, which means you cannot check where you are going, you then get on what you think is the right bus, and end up in Poland. We thought, after staring at the inscrutable timetables for a bit, we should get the Bus Nos 3 or 4. We asked a couple of drivers. They suggested 7 or 10. Another trip to the bus office proved they were in fact wrong, and we should get 4 or 7. This happened frequently during our trip. We would ask drivers/flight attendants/ train ticket inspectors and pedestrians where they were and where they were going and strangely, they hadn’t a clue. Totally exacerbated and, my original insistence on independently negotiating the bus transport wilting, we found our bus that would take us to the station, and it was one of the ones with “taxi” written on the front of it in fat, comforting letters. At the station, further confusion of the tourist travel variety ensues. The automated machine deals in what appears to be a pre-Etruscan latinate dialect, and demands something that looked like drachma for payment. The ladies behind the grotty perspex window looked like frightening PE teachers. The queue was 17 people long. If it wasn’t for a kindly Australian girl who helped us operate the machine and then showed us that our bus timetable was concealed behind some tarpaulin sheeting that had been placed outside the station by a construction company, we would still be walking in circles around the forecourt of Siena station weeping and crying about going back to England. She had learned the hard way several days earlier about bussing it down to Chianti. She had missed the 7.25am bus by four minutes, and there wasn’t another for 6 hours. Then, between 1.25pm and 1.35pm they send four of them, full to bursting with adolscent school children. Not bad, eh? I mean, it’s better than Watford High Street. Just about. The first (and only, it turned out) drops of rain of our holiday fell down as we searched for our hotel, through the streets with tiny shops groaning with pecorino, Pienza’s most fabulous invention. Fortunately, it was off-season, which mean the drone of loud Americans was reduced to nothing more than a slightly irritating hum. Our hotel was the lovely http://www.arcadipienza.it/ run by the fabulous and helpful Gloria, who proved to be the most patient person we encountered on the trip when it came to my Italian grammar. Our room was so delightful that we suddenly passed out in it on arrival due to exhaustion. Pienza is tiny, but it was no doubt the most charming destination of our entire trip to me. Meandering through back streets brings you only to another low, city wall and another devastating view. We took a brief tour around the main church, which was inviting and full of light, although I preferred the darker one next door. My brother texted for another brother’s postal address to send a birthday card. I said I was away, I didn’t have it and was about to eat wild boar in Tuscany. He replied that he was in the West End, it was raining, there was a tube strike, the Tories had gone and abolished child benefit for men like him, and to top it all off, the X Factor was back on TV. For once, it seemed, the London Bluebird was better off overseas and away from blighty. We sat down for a pre-supper glass of wine. Despite the fact there was a chill in the air, it was still glorious to sit looking out at a Renaissance square in front of you, the drop-dead gorgeous view of the Chianti valley to your left and, to your right, the generous proportions of the large-bottomed American lady speaking loudly about the stress of looking after her aged mother. Oh well, you can’t have everything. We popped back to the hotel before going out again to our pre-booked table at Dal Falco, which I cannot rate highly enough. http://www.ristorantedalfalco.it/ There’s a lot of poncing around going on in Tuscany. A lot of smug-looking English-ers poncing about ordering over-rated expensive wines whilst missing out on the delectable local vino, a lot of pretentious lip-smacking goes on, particularly about boar. Dal Falco was refreshing in that it was a real restaurant, frequented by large families, and run by another large family. At the table next to us, about 12 members of one family came and went from the restaurant in the space of two hours, headed by a grandmother who spent an hour and a half with the television remote control in one hand and her fork in the other, listening very loudly to a TV movie set in 1920s Italy whilst she sat directly underneath it ignoring most of her fellow diners. The food was, of course, perfect. Mr Bluebird opted for pici pasta with porcini, following by lamb chops and spinach, and I went for a wild boar stew – delicious, simple, local wine of the house at €8,00 a litre. My husband always leaves room for pudding, and usually makes sure that pudding is a tiramisu. This was all delightful, and we stayed there for three hours in the end, watching the various members of the family that ran the restaurant pile in, chat to each other and pile out again. 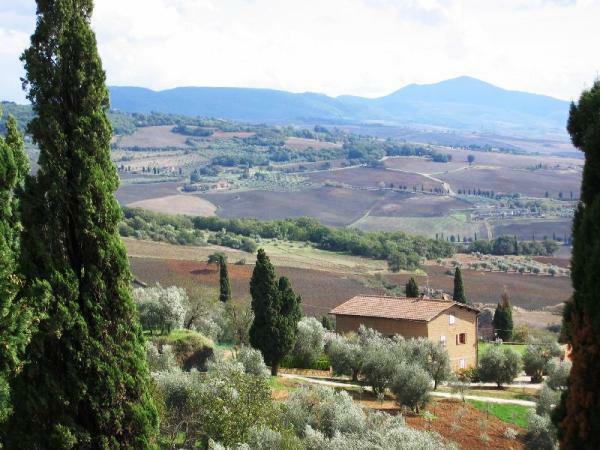 It must have been the post-dinner double espressos that meant I got the outrageous giggles back in our hotel room, where drunkenness and sheer joy of being in Pienza meant that I ended up laughing at nothing in particular until I wanted to be sick. This entry was posted in Uncategorized and tagged The Italian Job. Bookmark the permalink.